Janna Siller, often found in the fields, is the farm director at Adamah. Photo by Rahel Musleah. 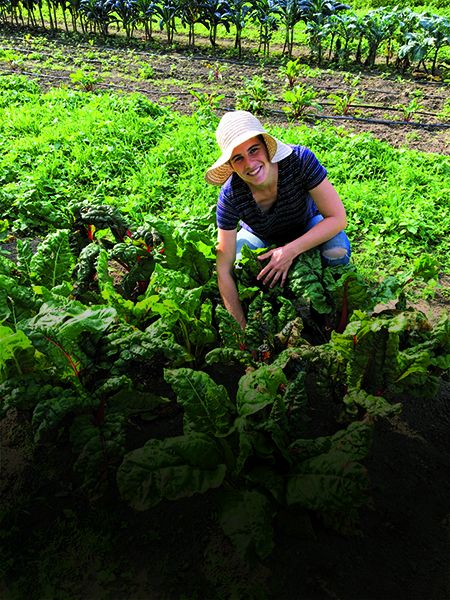 Janna Siller supervises her farm crew as they hoe and hand weed the beds of mesclun springing up in tender shoots of red and green oak leaf, romaine and mustard. As the farm director at Adamah, a 10-acre organic production and teaching farm in Falls Village, Conn., she is disappointed that the area hasn’t seen rain in almost two weeks. Working with an apprentice, she rotates black drip hoses from winter squash, which is ready for the fall harvest, to the lettuce. 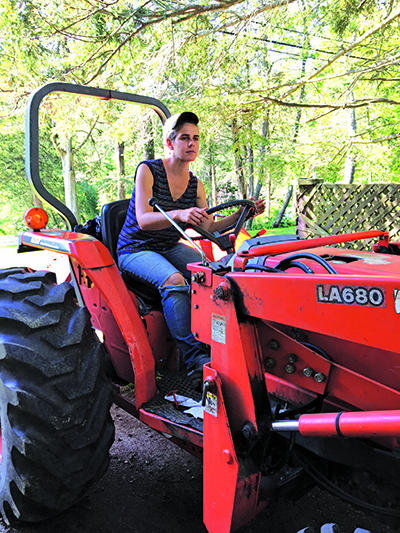 Earlier in the day, she drove an orange Kubota tractor to rototill the soil and prepare beds for seeding. The week’s harvest will be picked and used at the Isabella Freedman Jewish Retreat Center across the road as well as provide the produce for two local CSAs (community supported agriculture groups) with a membership totaling 100 families. In addition, Adamah annually produces over 5,000 pounds of cucumbers, cabbage and berries for its pickle and jam business. Some produce is also donated to a soup kitchen in Hartford and to low-income seniors. During the winter, Siller plans for the next year, ordering seeds, plants and tools; organizing and repairing; and preparing curricula for the numerous classes she teaches on everything from practical farming to the politics of agriculture. Though she looks every bit the farmer in her floppy straw hat, striped-navy T-shirt, jeans and work boots, Siller, 35, shatters the stereotypical image of what she describes as “the white male farmer in soiled overalls and five o’clock shadow with two of each animal.” She embodies three identities that are infrequently thought of in combination: Jewish, female and farmer. Siller is part of a generation that is incorporating Jewish values and spirituality into a back-to-the-land movement and agricultural activism. Through their work, the environmental awareness that was once celebrated almost exclusively on Tu B’Shevat—a Jewish Arbor Day that begins this year on the evening of January 30—has been elevated to a new level. Siller is also a prime example of a growing but still relatively small group of Jewish women who are turning to farming as a way to fuse their love of the land with Judaism. She is also part of a larger trend in farming. According to The Female Farmer Project, which is documenting the rise of women in agriculture around the world, women now constitute farming’s fastest-growing demographic. Between 1982 and 2007, the number of female-operated farms in the United States nearly tripled from 121,600 to 306,200, states a 2013 report from the U.S. Department of Agriculture. But Audra Mulkern, who founded the project and is working on a documentary Women’s Work: The Untold Story of America’s Female Farmers, notes that it’s a challenge to find accurate statistics for a variety of reasons, including the fact that the census of the agricultural industry only takes place every five years. Many of the women she has interviewed are first-generation farmers who own small commercial or community farms of less than 40 acres where they grow “a little of everything” and raise animals, Mulkern says. It’s rare to find a woman-owned large commercial operation of 10,000 acres, which are usually inherited and concentrate on commodity crops like corn, soybeans and cotton that can be easily traded, stored for a long time and grown in large quantities. Women are intuitively drawn to the idea of producing, growing, tending and mending, agrees Liz Vaknin, 28, co-founder with Shelley Golan of Our Name Is Farm, a Manhattan media company that works with farmers to define and grow their brands. “Being fruitful is our natural way. It’s spiritually uplifting, even when it’s physically taxing,” says Vaknin, a professional chef from a Moroccan Jewish background who estimates that about 15 percent of the farmers she works with are Jewish. Farming also liberates women from the stereotype that they are not physically strong or capable, she adds. Jewish women choosing this path range from farmers who plow the fields themselves or tend chickens, turkeys and goats, to those who work at high-tech urban agricultural facilities. They work at nonprofits—like Adamah and Coastal Roots—as well as at entrepreneurial enterprises. They are also community organizers, managers and educators. Most are college graduates who feel a visceral need to reconnect to the land after their academic pursuits. Hardly a quaint, romantic or simple job, farming requires grueling physical labor as well as intensive study of subjects from disease management and ecosystems to marketing and carpentry. It’s not easy but it’s possible to make a living as a farmer, says Vaknin. Men and women face many of the same physical and financial strains. Farming is expensive and the return may not always be guaranteed. There is one difference, she notes: If a woman decides to have children, she may have the added stress of farming or not being able to farm at all during her pregnancy. “Maybe she has a partner, maybe she doesn’t. It isn’t easy, regardless,” says Vaknin. Though Siller and many of her peers are first-generation farmers, Jewish farming in the United States began over a century ago. At its peak in 1925, an estimated 10,000 Jewish farming families—around 50,000 Jews total—lived and worked on farms from New Jersey to Colorado, some of which had been established to resettle immigrants outside urban areas. Some also had a utopian vision. Adrienne Krone, an assistant professor of religious studies at Allegheny College in Meadville, Pa., who has been studying the community farm movement, distinguishes between Jewish farmers and farmers who happen to be Jewish. She defines Jewish farmers as those who set up their organizations, mostly nonprofits, as Jewish communal spaces and reconnect to the agricultural foundations of Judaism. Many Jewish farmers today describe themselves as “Earthodox,” connecting to Judaism through the earth. They are also driven by a devotion to social and food justice, sustainability, eradicating hunger, providing food access and educating others. Adamah, founded in 2004 and known in the Jewish farming world as the “Mother Ship,” has served as one of the main entryways into farming within a Jewish context. Now part of Hazon, it blends commercial and community farming with the goal of creating a healthier and sustainable planet from a Jewish perspective. “Our commercial farming serves to feed our community farming mission, both as a profit generator for the program and as a project around which the community-building happens,” Siller explains. Siller has led the farm for the past six years, serving as role model for many women. Among the 380 graduates of its 14-year-old fellowship program, 272 are women, and the percentage of women has stayed fairly steady. Some have gone on to start their own farms. About 20 Jewish community organizations with farms now operate across the United States and Canada. Four were founded and are headed by women: Shoresh in Ontario, Canada; Netiya in Los Angeles; Milk and Honey Farm in Boulder, Colo.; and Ganei Beantown in Boston. At other farms (including Adamah, whose overall head is co-founder Shamu Sadeh), many women are farmers on staff or hold leadership positions—but not the very top spots. Some organizations are trying to bring Jewish farmers together. JOFEE, the Jewish Outdoor Food, Farming & Environmental Education Network, is comprised of 30 different organizations and enhances Jewish identity through immersive programming, including four days on a farm. Jewish beekeeper Sabrina Malach checking the Shoresh hives at Bela Farm. Photo by Nick Kozak. 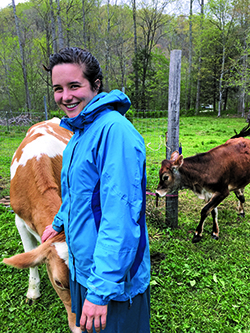 A year ago, a Hazon food conference prompted two farmers, Sarah Seldin and Shani Mink, to initiate the Jewish Farmer Network to raise visibility, increase connections among farmers and share resources. The network’s Facebook group grew from 200 in the first two days to some 420 as of December; 56 percent are women, and the largest age demographic is 25-34. An Instagram page, A People of the Land, features different farmers each week. Sabrina Malach dons a protective white bee-keeper’s suit and mesh veil as she approaches the apiary of 30 hives at Bela Farm, a 114-acre rural center for sustainable land-based Judaism in Hillsburgh, Ontario. Asters, goldenrod and sunflowers bloom around her, and maple and basswood trees provide shade and food for the bees. 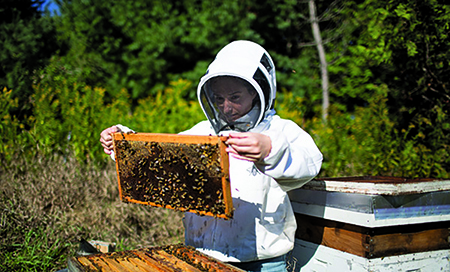 In addition to her role as beekeeper, Malach, 36, is director of community engagement at Shoresh, one of the four community partners on Bela Farm and the only Jewish environmental organization in Canada. Bees, she says, are in crisis: They are dying worldwide largely because of toxic pesticides, and the farmers who rely on them for pollination are worried. “If we destroy our world it will be disappointing to our Creator,” she says. “We’re commanded to guard and protect our planet.” The bees also provide a sustainable product for Shoresh, which sold 1,200 jars of honey this past Rosh Hashanah. In addition to supporting the bee sanctuary, Shoresh is reforesting the farm by planting two million native wildflowers and 11,000 trees. Malach grew up in a Reform household in Toronto with strong environmental values. But it was not until she participated in a life-changing Adamah fellowship in 2005 that she linked her two previously compartmentalized identities. She went on to Jerusalem’s Yeshivat Simchat Shlomo Eco-Activist Beit Midrash; worked for Hazon as a program assistant; and received her master’s degree in environmental studies from York University in Toronto with a focus on pollinator protection in urban centers. In 2011, her friend Risa Alyson Cooper, an elementary school acquaintance with whom she reconnected at Adamah, invited her to join Shoresh, which Cooper had founded in 2009. Sarah Seldin of the Jewish Farmer Network. Sarah Seldin, 25, credits farming for healing her disordered relationship with food. “You have to nourish yourself if you are farming,” she says, noting that she struggled with bulimia in high school. Raised in North Carolina, Seldin embarked on a road trip after college to choose where she would live. Traveling the country, she realized that despite her academic degree in American studies and socioeconomic justice, she knew nothing about how food was grown. At a friend’s suggestion, she apprenticed at The Lord’s Acre, a community garden outside Asheville, N.C., that grows and gives away organic food. Currently a displaced farmer living with friends on the edge of Pisgah National Forest north of Asheville, Seldin had leased an acre of land in Earthaven, an off-grid eco-village outside Asheville. Last July, however, whooping cough broke out among the children in the community, some of whom had not been vaccinated. Concerned about infecting her grandparents, who live nearby and whom she often visits, she abandoned her plants and two greenhouses full of peppers and tomatoes after only five months. She returns every two weeks to mow and weed. “It was heartbreaking,” she says. For now, Seldin plans to develop the Jewish Farmer Network she co-founded and hopes to build a Jewish community farm in North Carolina. With few expenses and some winter income consulting with organic businesses, she says she can make ends meet as a farmer but acknowledges that if she had car payments, a mortgage and loans, farming might not be a tenable option. She says her family has warmed to the reality of their daughter the farmer. Her mother, Judy Seldin-Cohen, a social justice advocate in Charlotte, included stories about food justice in her upcoming book, Recharging Judaism: How Civic Engagement Is Good for Synagogues, Jews, and America. Mom and daughter went on a research trip together for the book, visiting Adamah; Abundance Farm, a synagogue-based food justice farm in Northampton, Mass. ; and attending Hazon’s food conference together. “It has been such a joy that our work intersects,” says Seldin-Cohen. Irinel Stegaru-MacLaughlin (left) with her daughter, Maya. Every summer morning from about 10 to noon, Irinel Stegaru-MacLaughlin, 52, goes out with her mother, Dr. Beatrice Stegaru, 79, to their half-acre orchard in upstate New York to harvest raspberries, blueberries and rare seasonal fruit like gooseberries, elderberries, quince and currants. In the fall, they pick apples, heirloom peaches and mulberries from their 35 fruit trees as well as pick and purchase other organic fruit from local family farms. The fruit goes into their award-winning jams and syrups. 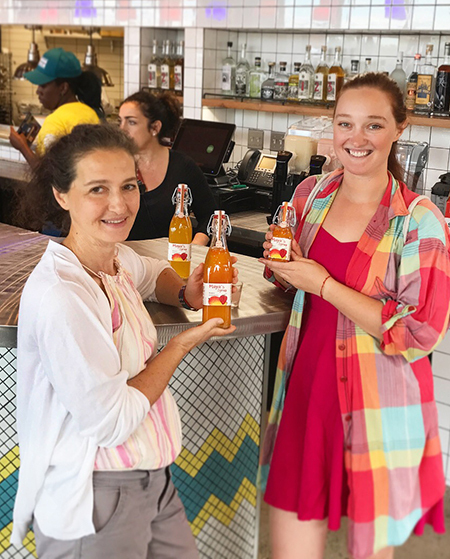 Named Maya’s Jams, the women-owned business was inspired by the now 26-year-old Maya MacLaughlin. ​The women did not start out as farmers, jam-makers or entrepreneurs, but fresh food was always a way of life. Romanian-born Dr. Stegaru fled Communism as an adult, settled in Germany with her then-2-year-old daughter and became one of the country’s first female cardiologists. Stegaru-MacLaughln, a professional photographer and art teacher, received a Fulbright scholarship to study in the United States and met her husband, Geoff, during the first week of classes. They went back to Germany, where Maya was born, and immigrated to the United States when their daughter was 17. At Bard College, the homemade jams Maya shared with fellow students were a great hit, and spawned the idea for the business. Each woman has her own role, teaming up to cook complex blends like blueberry blackcurrant in a rented Harlem kitchen once or twice a month. “It means a lot to us that we can do this together,” says Stegaru-MacLaughlin, who uses Our Name Is Farm, the New York City media company, to help with their branding. Rahel Musleah, a frequent contributor to Hadassah Magazine, runs Jewish tours to India and speaks about its communities (explorejewishindia.com). have you heard of Alliance, New Jersey- the colony. starting to refarm settlement from 1880’s my family were settlers there. I think they could use your help and ideas. love to start living on that land and starting all over again. don’t think there is any extra housing. loved the article. great!My be they could build wooden dorms so people to come and experience that you and other have learned.Carol Kessler ,Philadelphia, Pa.
A revelation. By just reviewing “the facts”, Ms Musleah has created a mini journal of the rejuvenation (no pun intended, originally) of women and the soil . In an age where the semi inspired consumer looks for “NO GMO” on the packaging, and the demi educated shopper goes to the farmer’s market seeking local organic, sustainable…the acknowledgment of women saving the planet and our digestive systems is empowering. With the miracle of the Second Women’s March still warm in our neshomahs, such a tangible simchah as Jewish women farmers is a welcome second helping of nachus. Plants have been genetically modified for hundreds of years. Grafting, hybridization, cross-pollination, etc. GMO has made it possible to produce plants that are insect and disease resistant hout the need for synthetic pesticides. If organic farmers used GMO technology, they would not have to rely on finding natural predators and biological pesticides to produce high yielding crops. I recommend the following book: Mendel in the Kitchen: A Scientist’s View of Genetically Modified Foods Paperback , 2004. ByMarie Brown and Nina Fedoroff. Don’t jump on the anti-science bandwagon. Inform yourself. Here is a link to the currently active farming effort is Alliance that is mentioned by Carol above. https://www.facebook.com/ACReboot/ The cover photo of Malya Levin would make a great addition to your article! Thanks for the inspiring article and thoughtful contributors. Actually there are only 9 crops that are GMO. My daughter Dr.Mollie Sacks, works for SHAHAM, the Extension Service of the Israel Ministry of Agriculture. Here they are cooperating with farmers to produce applied knowledge through field experiments and observations. I am very proud of Mollie, a life-time member of Hadassah, as I am. The three of us made Aliyah from the U.S. in 1970 when Mollie was 12 years old and Laurie, my poet daughter, was 14. Mollie’s work includes advising farmers on soil fertility and irrigation technology. She is also sent to third-world countries, such as Ethiopia and recently to Myanmar (Burma), to teach about drip irrigation. Mollie began her career in a NAHAL brigade, a branch of the Israeli Army (Fighting Pioneer Youth). She worked primarily in the fields of kibbutzim, and realized that she wanted to work outside, always being in touch with Nature. After the Army, she earned a Master’s in Hebrew University, in Environmental Science, married, and traveling with a 4 month-old baby girl, continued her Dr. studies in Soil and Water Science at UC Davis, California. Efficient use of water; water recycling; use of reclaimed and marginal water. Develop technologies and mechanization, thus saving in labor force. Decrease usage of pesticides in agriculture. Promote agricultural subjects that are related to the quality of the environment (dairy-farm reform; use of sludge in agriculture; prevention of agricultural trimming burning, etc).